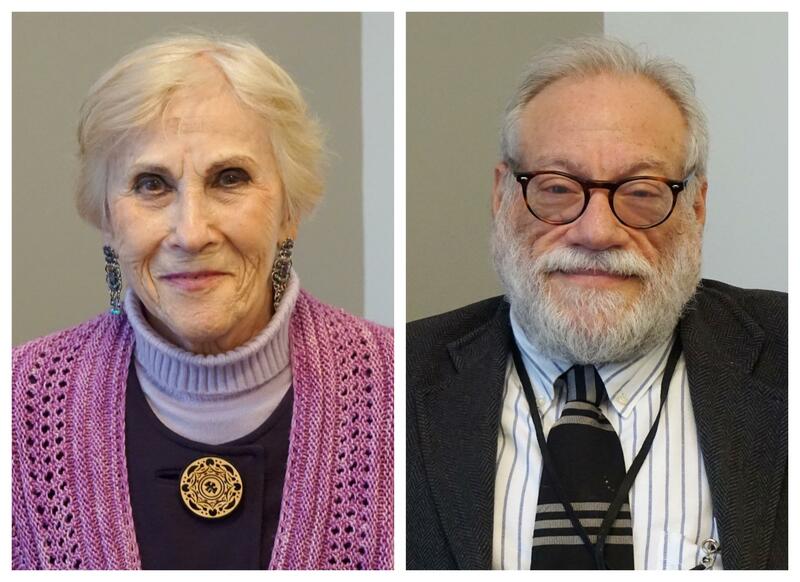 Rachel Miller (left) and Dan Reich (right) discussed how the younger generations will continue to tell the stories of those who experienced the Holocaust on "St. Louis on the Air." Joining the program alongside Marsh and Reich was survivor Rachel Miller. The three of them discussed how the younger generations will continue to tell the stories of those who experienced the Holocaust as survivors pass away. Miller, who now resides in Chesterfield, Missouri, also shared her own harrowing story of living through the Nazi occupation. Miller’s parents left their “comfortable home” in Warsaw, Poland, in 1932 due to the rise in anti-Semitism and resettled in Paris, France – where Miller was born a year later. “1939, September 1st, I was sitting on the buffet [and] my father was cutting my hair when I heard him say to my mother, ‘It’s the beginning of doom,’” Miller recalled, adding that it was the day Germany invaded Poland. The Nazis went on to invade France and other European countries. Miller’s father later died due to Nazi experimentation, and in an effort to save Miller’s life, her mother sent her away to a farm in the countryside – where only the farmer and Miller’s closest friend knew of her true identity. “My mother said to me, ‘Rachel, I'm going to give you a new name. Your new name is Christine, and you're not allowed to tell anyone you're Jewish,’” Miller recalled. Her mother and siblings had planned to join her in the countryside, but they were picked up by Nazis in a raid. “I was very angry at my mother. Why did she send me away? Why didn’t she keep me with her? I was a child. I was 9 years old,” Miller said. During the following years, Miller lived with her aunt in hiding to avoid raids. It wasn’t until after the invasion of Normandy and the end of World War II that Miller discovered93 members of her family had been murdered in Auschwitz. A soldier found Miller in an orphanage and brought her to the United States when she was 13 years old – and physically abused her multiple times in that process. “I was in five different foster homes until I get married. So my war did not end when I came to the United States – it continued until I got married,” Miller said. As survivors pass away, museums and other organizations look for ways to continue telling the stories of those who experienced the Nazi occupation. “We've lost a significant number of our survivors, which is why we treasure the survivors we still have … We have been having children of survivors tell their parents’ story and that can be very effective. It's not quite the same as that first person. We do have an oral history project. So we do have our survivors on tape, but it’s still good to have that actual voice,” Reich added. “I lost 93 people in the war, and I became their voice. It's important for me to talk about them so they are not forgotten,” Miller said, also remembering the lives of the 23 million people murdered by the Nazi regime.